Those five words have become the latest pop-culture phrase, the "Where's the Beef?" 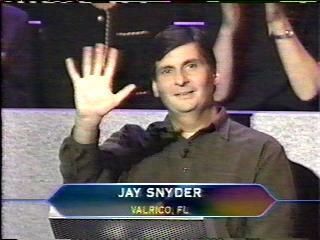 of the new millennium, ever since the August, 1999 debut of ABC's hit TV game show, "Who Wants To Be A Millionaire?". My wife, Bobbi, and I became "addicted" to the show since the initial episode. We found it fascinating to watch the average guy (or girl) next door appear on national television, sitting across from host Regis Philbin, with the opportunity to win as much as a million dollars. Watching at home, it seemed I could (almost) always answer the "Fastest Finger" questions quicker than most of the contestants, and I frequently found myself yelling at the "hot seat" contestant on TV, somehow expecting that they would actually hear me, and saying things such as, "My God, that question was soooo easy! ", and "How could they not know that answer?" I just knew that I could do at least as well as most of the contestants. 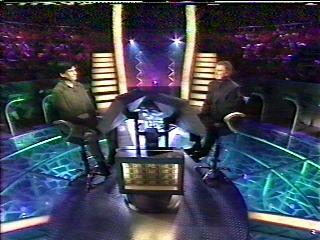 At some point during the broadcast, a toll-free phone number would appear that you could call to try to become a contestant. Like most people I know, the feeling was that it would be next to impossible just to get through on the phone, let alone successfully answer the questions. Nevertheless, I decided to call, and surprisingly was able to get through and hear the recorded voice of Regis Philbin. According to the show's statistics, I was one of approximately 240,000 callers that are allowed to play the telephone game on any given day. You are asked three "ordering" questions of increasing difficulty, similar to the fastest-finger round. You use the telephone keypad to enter your answers, and are given ten seconds to answer each question. If you successfully answer the three questions, you are asked to select a "tape date" and are put into a "pool" with all the contestants that qualified during that qualifying round and selected the same tape date. You then hope to be one of the fortunate few that are randomly selected to get a call-back the following day. I repeated this process for nearly a year, successfully qualifying on numerous occasions, but never getting a call-back. 1. "Put the following words in order to make the title of a popular song:"
2. "Based on their leaders, put the following countries in geographical order, starting in the north:"
3. "Put the following foods in order of when they were introduced into the US, starting with the earliest:"
After correctly answering the third question, I was asked to select one of five available "tape dates." For no particular reason, I selected the second taping on September 14. I was then told that the call-back, if there was going to be one, would happen the next day, August 25, between noon and 3 P.M.
Having gone through this routine on many previous occassions, I had very little hope that the call would come. I was caught totally off-guard when, at approximately 12:50 p.m. on August 25, my phone rang at work and the caller said his name was Joe Richardson and was calling from the show. While I was trying to compose myself, he proceeded to ask several questions to be sure I was eligible to be a contestant. When we were done, he told me I was scheduled to compete in a second telephone qualifying round of five questions (in a format similar to Round 1) which would take place the following week, on August 31. I was given a special toll-free number and my own PIN number to be used when I called. Qualifying Round 2 took place at 3 P.M. on August 31, 2000. Unlike Round 1, you are not told whether or not you've answered a question correctly, so you answer all five questions and hope for the best. 1. "Put the following in order to make the title of a popular Beatles song:"
2. "Put these countries in geographical order, starting in the west and going east:"
4. "Put these people in alphabetical order by their middle initial:"
5. "Put these movies in order of when they won the Best Picture Oscar, starting with the earliest:"
I was told to be available between 4 P.M. and 8 P.M. that same afternoon for a possible call-back. I was pretty certain that I missed both Question 3 ("authors") and Question 5 ("movies"). When I got home, I decided to research the answers to the questions. I was amazed to find that all five questions were answered correctly. Suddenly, I realized that maybe I did have a chance, as slim as that might be. Shortly after 5 PM, the phone rang. I think I went into a state of shock when I heard, "This is Lisa Meyers calling from Who Wants To Be a Millionaire?'". I could hardly contain myself as she, too, asked me several questions regarding eligibility, availability, etc. When she had finished asking all the required questions, she spoke the fateful words, "You've qualified to become one of the ten finalists that will appear as an "on air" contestant on the episode that will tape on September 14, 2000"
Lisa told me that they would be flying me and Bobbi to New York City on September 13, would tape the show on September 14, and return home to Florida on September 15. Needless to say, we had quite a celebration. I had only told a few people about competing in Round 2, so as not to "jinx" myself. That evening, and most of the following day, were spent sharing the news with friends and family. The next two weeks were like being in a "dream world". I found myself walking around almost in a daze, mainly because the odds of anyone getting on the show are so small, and the chances of it happening to me were incalculable. Between the anticipation of being on the show and trying to "cram" for the show, all I could think about was what the future would bring. I had to constantly remind myself that just making it to the show was a major accomplishment, and not to expect anything more. In reality, this was only the beginning…the real challenge would be to win one of the "Fastest Finger" rounds in order to make it to the "hot seat". I also told myself that, should I get to the "hot seat", I'd be more than happy to walk away with $32,000. When you are selected to be one of the "on the air" contestants, you are told to select up to five people to use for your "Phone-a-Friend" lifelines. Deciding who to use was a mind-numbing chore. I'd hope to find friends that were knowledgable in multiple subject areas, and were willing and able to be a lifeline. Surprisingly, several friends declined the opportunity, saying they didn't want the responsibilty, particularly since a large sum of money might be involved. My finalized list consisted of Arthur Kavanaugh, a boyhood friend and history teacher; Terry Quinn, a neighbor and professor at the University of South Florida; Elliott Heisman, my brother-in-law who has a Masters degree and whose wife is an optometrist; Kathryn Butterly, a co-worker and literature buff; and Jay Jayson, a friend who is well-versed in trivia, oldies music, and other basically useless information. Upon arriving in New York, you give the names and contact information to the producers. The morning of the taping, each person on your list is called by the staff to confirm their eligibility and to verify their contact information. They are told that the taping will take place between 4-7 p.m., and to be near the phone. During the taping, if you get to the hot-seat, the producers contact all five lifelines and tell them to be prepared, to answer the phone on the third ring, and to make sure they are the only one to answer the phone. The lifelines are also contacted later, when they are no longer needed. Off to "The Big Apple"
On September 13 2000, Bobbi and I flew to New York City, where we were met by a driver with a "stretch" limousine just for the two of us. Having lived in Philadelphia most of our lives, we had visited New York City a number of times in the past; even so, there was something special about being chauffeured through Manhattan in a limo. We were put up at the Empire Hotel, an older (but comfortable) hotel near Lincoln Center on the Upper West Side. That evening, the contestants met with staff member Susan Vescera. The purpose of the meeting was to introduce ourselves to each other, check out our "show outfits" to make sure they were acceptable for television, and to discuss the next day's agenda. We were also given a souvenir T-shirt and $150 spending money. (This was in addition to the airfare and hotel being paid for). Since two shows were going to be taped on September 14, the contestants for both shows and their companions were told to meet in the hotel lobby at 6:45 a.m., where would be taken to the studio in a shuttle. Upon arriving at the studio, we went through a security check, and any research or reference materials, cameras, etc, were "confiscated" until we left at the end of the day. We were told that, from that point on, we would have no contact with the outside world until we left the studio later that evening. For security reasons, and to avoid any appearance of impropriety, we were not permitted to take any photos, talk to any employees we may pass in the hall, etc. We were escorted everywhere we went. Every trip to the restroom became a chaperoned "group event". We were led to an area called the "green room" to meet two of the senior associate producers, J.P and Lauren, who described what our day would be like, and above all, to relax and have a great time. We were given breakfast around 7 a.m. While eating, we got to know the other contestants and were individually interviewed by several staff members, who asked about my background and as many "interesting facts" as possible for them to put on the "blue card" that Regis would be given in the event we made it to the "hot seat." All the contestants and companions were treated like royalty, and the staff went out of their way to accommodate us and make us feel welcome. After breakfast, we were taken to rehearsal, and that's when it finally hit us…we were on the actual set that we'd all been watching on TV. Surprisingly, the set seemed much smaller than on TV, maybe 15 to 20 feet across the stage, with seats for less than 200 in the studio audience. It was an overwhelming feeling. The companions were seated in one section of the audience. The Show 1 contestants were seated in the "Fastest Finger" seats first, and the Show 2 contestants sat in the audience, immediately behind them. Our seat assignments were pretty much randomly determined by the staff, except for those contestants who may be wearing glasses. They were assigned seats where the spotlights would not reflect off their glasses. We are introduced to Beth, the stage manager, and Alex, one of the corporate attorneys, who gave us a legal briefing and instructed us about what to do, not to do, etc. We were also given the all-important "caveat" to "Ignore Regis", and to take his advice at our own risk. This is done primarily because Regis is not given the answers in advance, and should he say or do anything to lead us into choosing an incorrect answer, we would not be able to use that as a reason to be brought back to the show at a later date. Also, once the taping began, if we had any issues or problems whatsoever, we should get the attention of one of the producers immediately, who would stop the taping if necessary, in order to clarify and/or correct any situation. We were told to take as much time as we needed to answer the questions, but also to be smart enough to know when to walk away. They told the story of one contestant who took over 30 minutes for each of the $125,000 and $250,000 questions (and got them correct), and took an additional 57 minutes for the $500,000 question and missed it. Their point was that, after deliberating for that amount of time, under that kind of stress, you can convince yourself into believing practically anything. Another bit of information they shared is that, contrary to popular belief, there is no "computer" to select the two choices for the "50/50" lifeline…the correct answer and the most likely alternative are actually chosen by producer Michael Davies before the taping begins. We spent some time learning basic stage directions, such as where the cameras would be, how to enter and exit our seats, what to do and how to approach Regis if we won the "Fastest Finger" question, and got to practice the proper technique for getting into the "hot seat" without it tipping over (not as easy as it looks). We were given instructions on which camera to look at when we were introduced, and to pay attention to the red "on the air" light on the camera to know when to wave, since we probably wouldn't be able to hear our names being announced over the applause. After the Show 1 contestants were done, we changed places with them for our rehearsal. The "Fastest Finger" screens are about 18-24" square, with a small keypad at the bottom that has the letters A,B,C,D across the bottom, a "Delete" button to the left to erase an answer, and an "OK" button to the right. This keypad is probably 6-8" wide. We were given instructions on how to use the buttons. Special mention was given to being sure we pressed the buttons firmly, to release one before pressing the next, making sure you pressed all four choices (it would accept more or less than four, but would register as "incorrect"), and making sure we pressed "OK". Failure to press "OK" would result in a default time of 20 seconds. To help us become comfortable with the terminals, the stage, lights, music, etc, was set to simulate "on the air" conditions and we had five practice "Fastest Finger" rounds. The question is displayed at the top of the monitor. It appeared in a small white font and was difficult to read…not at all like you see on TV. I found I needed to lean forward quite a bit to see the question clearly. The question was read twice (as it would be done by Regis during the actual taping), then the four answers appeared on the screen as they do on TV. The clock starts as soon as the answers are displayed. The practice rounds turned out to be a very humbling experience, since I got two rounds correct (but very slowly), two incorrect, and one incorrect because I only pressed three answers, instead of four. That's when I realized that this was nothing like watching from home. When we were done, I honestly felt that I did not have a chance in the world of winning one of the real "Fastest Finger" rounds. Everyone had "lunch" at 10:30 a.m., then the Show 2 contestants waited in the "green room" while the Show 1 contestants went to "Hair & Makeup". During the next two hours, we tried to relax, nap, or do whatever we could do relieve some of the stress. At 12:30, we were taken backstage to watch the Show 1 taping on TV. (We weren't permitted to sit in the audience.) Show 1 was to be 90 minutes long, since they had a contestant from an earlier show return because of a "computer glitch" during the "Fastest Finger" round when he was on originally. It was fascinating to watch what goes on during taping, and to see how much is really edited out. A typical 60 minute show (less commercials) can take up to 3 hours to tape. The show is broken down into several "segments", with breaks between segments. During the breaks, a comedian keeps the audience entertained. Nearly everything is staged, rehearsed, or choreographed, even to the point of Regis being told (via Teleprompter) when to "ad lib". There were even instances where portions of the show were done over, particularly if Regis mispronounced anything. Show 1 began with the previous show's carryover contestant, followed by the special returning contestant, then the introduction of the new contestants. We did not stay to watch the end of the taping. Around 2:30 p.m., the Show 2 group had "dinner" (our third meal since 7 a.m.), then at 4 p.m. we went to change into our show outfits and were taken to "Hair & Makeup", where we had light makeup applied, our hair styled, and a microphone attached. Following that, we met with the staff and associate producers for a final briefing and a last minute "pep talk". Around 5 p.m., we were escorted to the set and introduced to Regis in a "receiving line" in an area underneath the seating area. The main purpose of this is to help Regis with the pronunciation of your name and city. Then, one by one, the announcer introduced each of us to the studio audience and we proceeded on to the stage and went to our assigned seats. The producers got the audience warmed-up, then Michael Davies came on stage and introduced Regis to the audience as "The man who single-handedly saved ABC". Our show began with the Show 1 carryover contestant, Mary Teykl. Due to scheduling issues, Show 1 was going to be broadcast on September 21, but Show 2 would not be aired until October 1. Because of this, it was funny to listen as Regis asked Mary questions about how she spent the "last ten days", which was really just a matter of a couple of hours. Mary left with $32,000. I once again told myself that, should I make it to the "hot seat", I would be thrilled to win that amount. We each got our "four seconds of fame" as Regis introduced us and we waved to the camera. The stage managers then had the cameras, lights, music, etc, put into "Fastest Finger" mode. My heart raced as Regis read, then repeated, the "Fastest Finger" question, which was, "Put these TV characters in order of their debut, starting with the most recent:" The characters were: A: Elaine Benes B: Peter Benton C: Theo Huxtable D: Dharma Finkelstein. As soon as I saw the four choices, I absolutely knew the correct order was D-B-A-C and I was feeling confident as I entered my choices, until I looked at what I'd entered and saw that in my rush to enter them as quickly as possible, I put them in the wrong order. The round was won by Joanne Osmolik, who was sitting next to me. At that point, I felt dejected, depressed and angry with myself, figuring that if I couldn't get that question right (a topic which was one of my strengths), then maybe getting to the "hot seat" just wasn't meant to be. Oh well...at least we got a trip to New York City and I got to appear on the show, which is more than a lot of people could say. I just decided to root for Joanne and whoever else made it to the "hot seat". Unfortunately for Joanne, she left with $1000 after missing the $16,000 question. During the break before the next "Fastest Finger" round, I told myself to relax, slow down, and try to concentrate on accuracy. Regis read the next "Fastest Finger" question, which was, "Put these novels in the order in which they were first published, starting with the most recent". The titles were A: The Bluest Eye B: The Accidental Tourist C: The Rainmaker D: The Big Sleep. My worst nightmare had just come true…I got a "literature" question. I had never read any of the novels, but I did remember seeing the movie versions of "The Rainmaker" and "The Accidental Tourist" within the last 15-or-so years, so I put them as my first and second choices. I also remembered a movie called "The Big Sleep" from the '40s or '50s, but I had never heard of "The Bluest Eye", so I just guessed and put them in "C-B-A-D" order, with a time of nearly seven seconds. The entire twenty seconds elapses before Regis reads the answers in the correct order. The names of the contestants correctly answering the question light up, and the name of the person that got them correct in the shortest time starts flashing. I was amazed just to see my name light up as having answered correctly, and was absolutely shocked when no other names lit up. This meant that I was the ONLY one to answer correctly. Talk about luck! I practically jumped out of my seat, and barely remember walking over to shake Regis' hand. During the break, they got my wife, Bobbi, from the audience and sat her in the "relationship seat" behind me, while I got into the "hot seat". A staff member applied some more makeup and brought me some water to drink. Then Regis came back on stage and got into his seat. Just as I was trying to relax and get as comfortable as possible under the circumstances, one of the associate producers approached Regis to let him know that there might be a problem. A controversy arose regarding the "Fastest Finger" question. Apparently, another contestant questioned the correct order of the novels, saying that "The Rainmaker" was an older novel, not the most recent. The producers asked me if I knew the correct order, or did I "guess"? I told them I was somewhat sure of two answers and guessed at the other two. On two different occasions, while they were trying to correct the situation, Regis said to me that we'd have to do the "Fastest Finger" over, then said, "Just kidding". At this point, I was much too stressed to find the humor in his remarks and I started to panic, wondering if we really would have to replay the round. Finally, after several minutes of discussion, the issue was resolved. It seems the other contestant was thinking of an older version of "The Rainmaker", which was either a stage or screenplay, not a novel, as stated in the "Fastest Finger" question. I could tell Regis was starting to become annoyed with the delay, and finally he said to the producers, "What does it matter if he guessed? Contestants guess all the time. Come on...let's do the show.!" The feeling of being in the "hot seat", on national television, is impossible to describe. It was a very "surreal" feeling, like being in a dream world. My mouth was extremely dry and my throat was tight. Drinking water didn't help much. I just couldn't seem to relax, partly due to the previous controversy. Surprisingly, I found that I really wasn't aware of the lights, the music, the audience, or the fact that millions of people would be watching me. As it turns out, I actually felt more relaxed than I appeared. Regis introduced me and we discussed some of the background information that I had supplied. Now it was time to get down to business as Regis said, "Come on…Let's play 'Who Wants to be a Millionaire?'" The house lights dimmed, spotlights were placed on Regis and me, and the $100 question appeared, which was, "If you can make someone do anything you want, he is 'wrapped around your' what?" A: Kitchen table B: Little finger C: Flagpole D: Christmas tree. As easy as the question was, my biggest fear was blurting out the wrong answer and leaving with nothing, not to mention the embarrassment I would have suffered. After what seemed an eternity, I correctly answered "B". With that out of the way, we continued with the $200 question, "Which of the following is a normal response to cold weather?" A: Shivering B: Sweating C: Turning green D: Doing the Macarena. This time, I answered "A". So far, so good. The $300 question was, "According to popular opinion, what do frog's legs taste like?" A: Fish B: Chicken C: Hamburger D: A pond. The correct answer was "B". For $500, the question was, "'Jack' is often the nickname for a man born with what first name?" A: Jeremiah B: John C: James D: Jonah. The answer was "B", another "no-brainer". It had become apparent to me that the reason these early questions appear to be so easy is to help the contestants relax and gain some confidence. I had reached the $1000 question, "What is the primary setting for the 1990s sitcom 'Wings'?" A: Hotel B: Military base C: Airport D: Marina. I had only watched the show once or twice, but that was enough to know the answer was "C". We took a break, and I realized I had made it to the $1000 "plateau". At this point, I knew I couldn't leave with less than that. What a relief to know I at least got that far and would go home with something. I was feeling pretty good about the way things were progressing, and I was happy not to have used any lifelines. After the break, Regis chatted with me and Bobbi for a little while, then he asked the $2,000 question, "In the English alphabet, how many letters rhyme with the letter 'B', not including 'B'?" A: Five B: Six C: Seven D: Eight. What should have been an extremely easy question ended up becoming an incredibly stressful ordeal. When the question appeared, I quickly came up with a count of "eight" in my mind, but I wanted to take a moment to recount them to myself, since I knew this was the type of question that there is absolutely no excuse for getting wrong (other than a case of nerves). 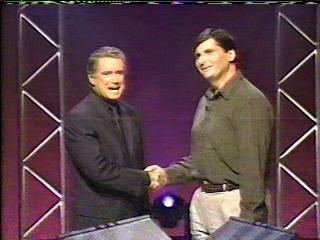 That's when Regis offered to "help" me by counting along with me. Each time I came up with what I was sure was the correct answer, Regis had a different result. To put it mildly, he was driving me crazy. I went through this process at least three times before I finally just blurted out, "D…Eight…Final answer!". Regis really got a kick out of the ordeal, jokingly saying, "Tell me the truth…you couldn't have done it without my help", to which I replied (dripping with sarcasm), "You're the man, Reege!" The $4000 question, "What mythical Greek character was condemned to hold up the universe for all eternity?" A. Apollo B: Hermes C: Atlas D: Demeter, was another relatively easy one (correct answer "C"), as was the $8000 question, "Which of the following towns is known as "The Biggest Little City in the World"?" A: Portland, OR B: Reno, NV C: Austin, TX D: Boulder, CO. I'm not sure where I'd heard it, but I knew the correct answer was "B"
I had some difficulty with the $16,000 question, "What baseball personality wrote the 1982 autobiography "Catcher in the Wry"?" A: Bob Uecker B: Yogi Berra C: Reggie Jackson D: Jim Bouton. Up to this point, I was zipping through the questions, so my first reaction was to think of which "Phone-a-Friend" might know the answer. When I couldn't come up with one right away, I decided to go it alone. I was able to eliminate "C" and "D", which left me with "A" and "B". I was so focused on the two remaining choices, I neglected to really study the question. At first, it didn't even dawn on me that they were both "catchers" (even though I knew they were) until Regis mentioned it. When Regis re-read the question, something about the date the book was written and the fact that it was an autobiography caught my attention. I knew Bob Uecker played somewhere around that time, and the title just seemed to fit his "dry" style of humor more so than Yogi Berra's. I made an "educated guess" with "A", and I was correct. This is great…$16,000, and I still have all my lifelines. Amazingly, I'd reached the all-important $32,000 question, which was, "Jazz pianist Vince Guaraldi composed the theme music for what TV programs?" A: Olympics B: Bill Cosby's sitcoms C: NBC Newscasts D: Charlie Brown specials. My initial instinct was to say "D", but I'd never heard the name and I really wanted to be sure of reaching the $32,000 level. I decided to use my first lifeline, "Ask the Audience". There was an overwhelming majority that chose "D", so I went with the audience's answer, which was correct. Thanks to the audience, I had reached the $32,000 level, meaning I couldn't leave with less than that amount…WOW! B: Marcel Duchamp C: Rene Magritte D: Gustav Klimt. I didn't have a clue as to the answer, so I knew I would have to use my second lifeline. Using the "50/50", would not have helped me at all, so I decided to use my "Phone-a-Friend". I didn't have anyone as an "art" lifeline, so I tried to think who on my list might have the broadest range of knowledge. I decided to call my neighbor (and college professor) Terry Quinn, who, with very little hesitation, said "Escher". He said he was 75 percent sure (he later told me he didn't want to sound too cocky by saying 100 percent). I went with "A" as my final answer and, thanks to Terry, I won $64,000. This was so totally unbelievable. The time just seemed to be flying by, and incredibly, I was now at the $125,000 question. It was, "What company's credit card advertisements most often use the name "C.F. Frost" on the credit card?" A. MasterCard B: American Express C: Discover D: Visa. Even before I saw the choices, I was thinking "American Express", but for some reason, I talked myself into thinking it could possibly be "Mastercard". Had there been less money at stake, I would have gone with my instincts, but this was serious money, and I stood to lose $32,000 if I was wrong. I decided to use my final lifeline, "50/50", and thankfully, "Mastercard" was eliminated, leaving "American Express" and "Visa". I deliberated a little longer, trying to get a mental image of the card in the commercial. I finally decided to go with my initial choice, saying, "B…Final answer". My heart was in my throat and time seemed to stand still while Regis prolonged the suspense as he is known to do. Finally, he announced, "Yes! 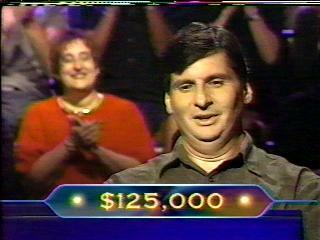 You've just won $125,000 dollars!" At that point, all I remember feeling was shock and disbelief. This was so far beyond my wildest dreams. After a much-needed break, my "moment of truth" came with the $250,000 question, "Which of the following animals has a skeleton made of "chitin"?" A: Tortoise B: Armadillo C: Grasshopper D: Carp. All the contestants returned to the dressing room, collected our other outfits and belongings and said our "Goodbye's" to the staff. We met at the van to take us back to the hotel, and we were all given a "souvenir" check for one million dollars. The flight back to Tampa was uneventful, and we got home sometime late on September 15, totally exhausted. period. There were articles about my appearance in most of the local newspapers, and I've been approached by both friends and total strangers, saying how they saw me on the show, and how great it was that someone they could actually identify with was able to get on the show. I haven't tired of talking about my experience, and hopefully never will. I frequently think about what might have been, "If only I guessed at the $250,000 question...", but, hey, who can complain about winning $125,000? This was truly a "once in a lifetime" experience that I'll never forget, not only for winning the money, but also for being a small part of a cultural "phenomenon." To quote Simon & Garfunkel, "Time it was, and WHAT a time it was..."